Exactly two years ago today, the Scottish Affairs Committee of the House of Commons published its report on the future of the Crown Estate in Scotland. Its conclusions were unequivocal. The responsibilities of the Crown Estate Commissioners in Scotland (CEC) should be ended and, subject to agreement on a scheme of devolution to the local level, the administration and management of the Crown Estate should be devolved. This recommendation was based upon the first comprehensive inquiry into the matter since the CEC was formed in 1956. Earlier this month, the Committee re-iterated its original findings in this follow-up report. Yesterday, the Scottish Labour Party published its Devolution Commission proposals (2.1Mb pdf) on further devolution of powers from Westminster to Scotland. Here is what is said about the Crown Estate (on pages 239-240). 602. Another area where it has been suggested scope for devolution to local authorities exists is in regard to the Crown Estate. In March 2012, the House of Commons Scottish Affairs Select Committee published a report on the Crown Estate Commissioners’ (CECs) management of the Crown property, rights and interests which make up the Crown Estate in Scotland. The Committee concluded: “at best, the organisation [CEC] has a fundamental misunderstanding of the needs and interests of local communities and indigenous industries on the Scottish coast … At worst, it behaves as an absentee landlord or tax collector which does not re-invest to any significant extent in the sectors and communities from which it derives income”. Accordingly, it was recommended that the administration and revenues of the ancient Crown property, rights and interests in Scotland, which are currently managed as part of the Crown Estate (including the seabed and the foreshore) should be devolved then decentralised as far as possible to local authorities and local communities, with devolution to the Scottish Parliament conditional upon an agreement between the Secretary of State for Scotland and the Scottish Government on how such a schemes should be implemented, on the basis of the principle of subsidiarity. This agenda has also been adopted by the Our Islands Our Future campaign. 604. We see merit in the argument for full devolution of the Crown Estate’s responsibility for the seabed and foreshore to local authorities. On the other hand, we are conscious that this could potentially undermine cross subsidy of investment and technical expertise on renewables. We need to balance these two competing viewpoints. We agree with the Crown Estate that the default assumption is that the seabed and foreshore should be managed by local authorities or local communities and that they have developed leasing arrangements which make this possible. If this can be made to work, allowing the Crown Estate to take an interest in particular developments, we will support this. Thus, we propose to use the Crown Estate’s expertise and capital as necessary, but allowing local councils and local communities to manage the seabed in other respects, in order to achieve real devolution to very local areas while preserving the benefits of the wider Crown Estate resource. 605. We therefore endorse the idea of the Crown Estate developing more effective partnerships at community, local authority, and Scotland levels. This means two things in practice. Firstly, local management agreements between local authorities and the Crown Estate, which are an example of best practice, should be applied as widely as possible, with the Crown Estate establishing appropriate mechanisms to facilitate maximum local authority and community engagement. 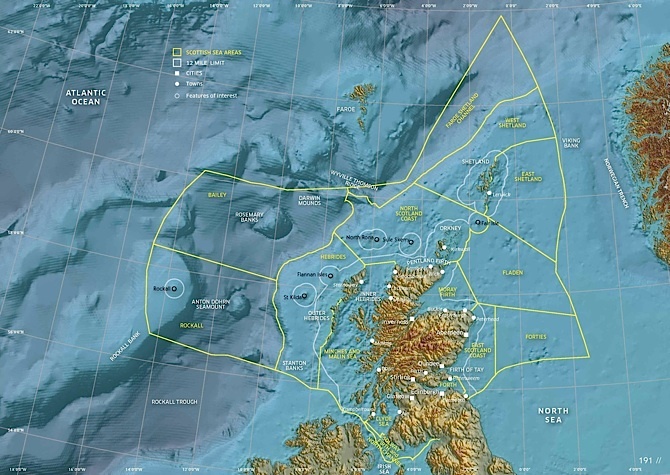 Secondly, a Memorandum of Understanding between the Scottish Government and Crown Estate should be agreed in respect of their common objectives on the development and management of the seabed and foreshore, and those local authorities with an interest in this area should be fully consulted throughout as to its contents. So – the Scottish Labour Party agrees with the Scottish Affairs Committee’s recommendations (full devolution) and hopes that the Conservative/Liberal Democrat Coalition Government will implement them (despite it having made clear that it won’t). But – if Labour form the next UK Government, it will not implement the recommendations and, instead, adopt the partial (and as far as I can see) a rather muddled approach outlined above. perhaps the Labour Party don’t know what’s going on either. Given the Scottish Affairs Committee is made up with a significant number of Scottish Labour MP’s, it is baffling to now see this report on devolution from the Scottish Labour Party – which seems to totally contradict much of what is set out in the SAC recommendations. The Crown Estate is merely an asset management company that manages crown assets on behalf of the Treasury. It is no different than a local authority managing public assets on behalf of local consituents/voters. Crown landed assets actually belong to the public – not to The Crown Estate. The assets are held in ‘trust’ by The Crown Estate on helf of the public. So if all political parties want crown assets devolved to Scotland, it raises the question ‘do we need the Crown Estate to remain as an entity in Scotland – or should we rebrand the organisation in Scotland and create a more fit-for-purpose entity?’. Local Management Agreements are a political smokescreen to make it appear that local communities have some say over crown assets; when in actual fact communities will gain no more control than they currently have a say over at present. The local management agreements will effectively set boundaries of responsibility and control over crown assets – so The Crown Estate will retain control over certain aspects such as dredging rights, renewable energy, fish farming etc. Communities will merely be consulted on proposals as they arise but will not have a final say or veto on whether propsals happen or not. The bottom line is crown land is either fully devolved to a completely seperate asset management organisation (or to local communities) in Scotland, otherwise we end up with an even more convoluted and tortuous management structure of crown land in Scotland that benefits no one. It is also bonkers to believe The Crown Estate will continue to invest in assets that have been devolved and they no longer control. They won’t. No different than devolving 20,000 acres of a landed estate from an overseas billionaire but the community expecting that billionaire to continue to invest in the assets going forward – why would he/she? What Labour propose is a fudge and does not consitute devolution of The Crown Estate in Scotland. Labour’s Westminster MPs have insisted that as little should be offered as possible. It looks like a clear case of cowardly politicking. Full devolution could be seen as a sop to full independence elsewhere and so the proposal is rejected. It is just as much gibberish as their Devo tax proposals. If Scottish Labour and Westminster Labour can’t agree with each other you get a fudge and a lack of clarity. In the long-term, one would hope that renewables such as offshore wind and wave will become the backbone of the Scottish economy. If the Scottish government has full control over all of the Crown Estates’ seabed revenue it can be reinvested back into the industry in support of their renewables development plans.